Dogs floated on rafts aided divers and navy sonar, ultimately detected body. The body of Natan Hajani, who was missing in the Kinneret (Sea of Galilee) for five days, was located this morning (Tuesday), after extensive searches by Zaka divers aided by a navy sonar system and cadaver dogs of the Israel Dog Unit (IDU). 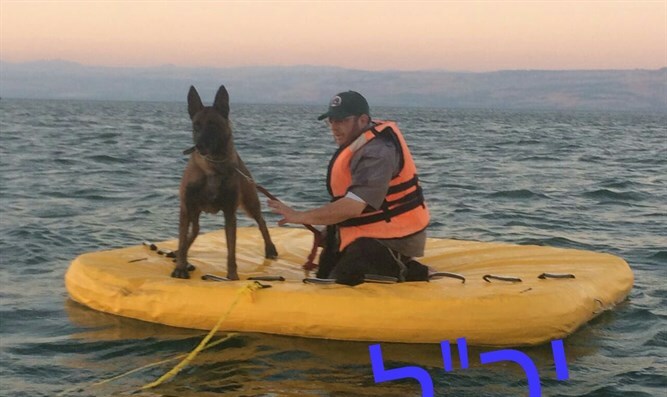 The IDU dispatched dog handlers with cadaver dogs to board boats on the Kinneret in an effort to find the 24-year-old newly married man. Dogs that were floated on rafts aided the divers and navy sonar, and ultimately detected the body very close to where Hajani originally drowned 5 days ago. The dogs worked from dawn to dusk every day for the duration of the search operation, joined by divers from the Israel Dog Unit. The dogs were particularly needed after the IDF naval sonar experienced technical failure during the operation. Cadaver dogs can smell gases and other odors from a body while passing over even deep water. The Kinneret is 16 meters deep in the area where the young man drowned. Nachman Hajani was married to Mor two months ago. A representative of Ichud Hatzala related that Mor's father drowned in a swimming pool when she was only seven. Hajani had jumped from a boat on Friday, and had been missing since then.